Unless one is a babe in the Lord who has just been born into the Kingdom, much of what he hears will be a repetition of what he has heard BEFORE. But unlike the wisdom of the world the Word of the Lord is quick and powerful and will speak in a DIFFERENT WAY every time hears it! And the saint never tires of hearing the same Word again and again though he may have heard it a thousand times; because to him God’s mercies (another synonym for the Word) are NEW EVERY MORNING! And great is God’s faithfulness in ministering to His people afresh ever day! “Wherefore I will not be negligent to put you ALWAYS IN REMEMBRANCE OF THESE THINGS, though ye know them, and be established in the present truth. The word ‘remembrance’ is used three times in the above portion to show the importance of BEING REMINDED of the truth. And the reason for this is: “Like every other faculty of our beings, the MEMORY has been affected by the Fall and bears on it the marks of depravity. This is seen from ITS POWER TO RETAIN WHAT IS WORTHLESS, AND THE DIFFICULTY ENCOUNTERED TO HOLD FAST THAT WHICH IS GOOD. God’s Word and anointed sermons preached which are full of the Word are quite unique! A single Scripture from a sermon spoken from the pulpit can speak to ten thousand different people in ten thousand different ways, applying to their ten thousand different circumstances! 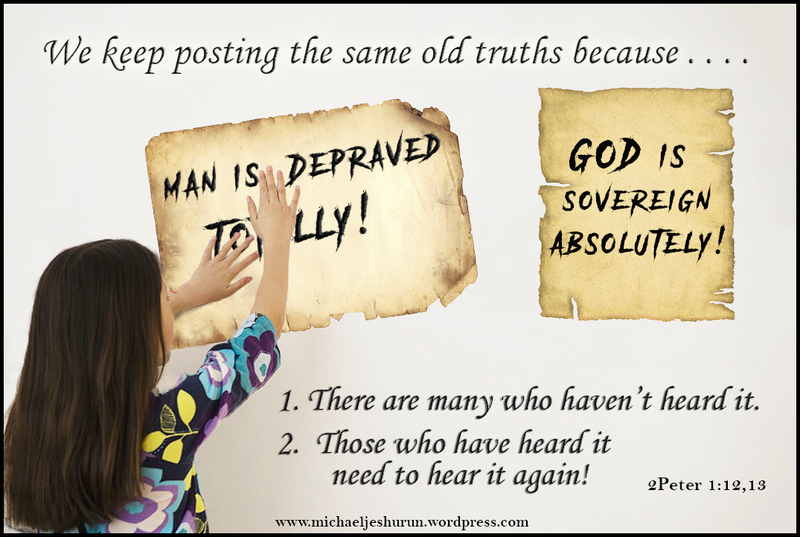 And so we preach, pretty much the same old truth again and again from every possible angle so that as many as possible may hear God’s Word and those who have already heard it may be further established in it. But if we are like the Athenians of Paul’s day who always crave to hear “some new thing” (Acts 17:21) and are ‘bored’ with the same old truth of God’s Word which true saints rejoice to hear then we will be greatly disappointed! “This little Book [The BIBLE] – it has said everything there is to be said. Everything is implied and anticipated in it. ← IS WATER-BAPTISM ‘NECESSARY’ FOR ONE’S SALVATION?